The film opens with our two heroines living out their daily miserable existence. Louise, played by Susan Sarandon, is a waitress at a fast food restaurant. Her husband is a musician and as such, is rarely ever home. Her best friend, Thelma, played by Gina Davis, is also married except her husband is always around. He treats her like an object; something that should be rarely seen and never heard. Finally one day Louise decides she has had enough; any life has got to be better than the one she is leading. So she finds Thelma, and the two of them hit the open road. Of course what initially seems like a great idea can quickly become a reality check. As they make their way they realize they don'thave any idea where they are going or what they really want to do. Things take a turn for the worse when Thelma is almost raped; Louise being the more confident of the two decides to take action and kills the man out right. Now what was initially an innocent road trip becomes a flight of their lives as they decide to head for the Mexican border. Of course this little incident isn't something that has gone unnoticed. A very determined detective named Hal (Harvey Keitel) is determined to bring in these two bandits. Thinking they truly got away with murder, the girls feel freer than they ever have before. Beginning to realize how many simple joys they were missing in life. One of the many stand out moments in this film is when they decide to pick up a hitchhiker by the name of J.D., played by the then unknown Brad Pitt, who used this simple role to garner himself a huge career. Thelma is smitten with the young vagabond, so much so that when he tells her he robs people for a living she doesn't even care. That is until the next morning when she awakens to find out that he has stolen all of their money. As much success as they seem to have, it is met with equal failure, culminating in a final showdown between the ladies and the police. Facing the reality of having to own up to their crimes, they decide to go for broke and make a run for it. For those of you who have not seen this movie there is no need to spoil the end for you, better you see it for yourself. This film is one of those rare pieces of cinema where all the right elements came into play, great director, solid writing, fun story, heartwarming characters, wonderful acting and beautifully shot. There isn't much that could take away from this movie other than that it does seem a bit dated, but anyone who can see this movie for how great it is, won't care when this movie came out. Now that it is on Blu-ray and being a Ridley Scott picture, it has gotten a fantastic set of extras. The film looks exquisite even on the small screen and there is no loss of sound quality what-so-ever. Some of the special features include: two separate commentaries, one by Scott and the other with Sarandon, Davis and writer Callie Khouri. An extended ending again with commentary from Scott, deleted and extended scenes, a multi-angle story board covering the final chase and the song "Part of you, part of me" by Glenn Frey. There aren't a lot of films that come out that really stand the test of time. Most of them, when viewed years later, just end up looking silly or out of date; some though can hold their own no matter how much time has passed. In another twenty years people will still look back at this film and love it for exactly what it is; two people taking control of their lives, deciding how they want their lives to be and to hell with the consequences. 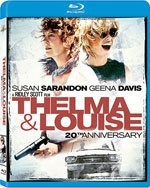 Download Thelma and Louise from the iTunes Store in Digial HD. For more information about Thelma and Louise visit the FlickDirect Movie Database.